Faced with sustainability challenges in a rapidly changing healthcare environment and an increasingly strained economy, The Perley and Rideau Veterans’ Health Centre has developed a long-term vision and strategy to align the organization with the evolving needs of the community. This is a revised version of the strategy, the initial version having been implemented starting in 2010. 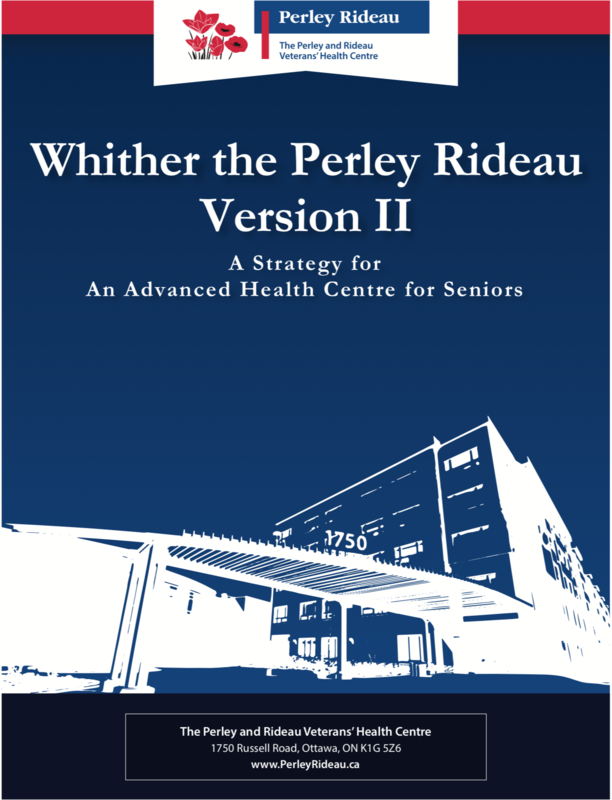 Perley Rideau’s vision is the following: Leading innovation in frailty- informed care to enable seniors and Veterans to live life to the fullest. Perley Rideau’s strategy is based on the themes of value and sustainability. Expanding the Health Centre’s capacity along the continuum of care and specializing in frailty-informed care will deliver greater value to the healthcare system. The expansion will support government policy to reduce costs and meet growing demand for the care of frail seniors. decreasing costs through improved efficiency and investments in long-term cost savings. Lead and Advocate for Change. The strategy is being implemented in three phases, the first phase having been started in 2010, during a 10–15-year period and beyond. Innovation grounded in meeting the day-to-day needs of the community has been a defining characteristic of The Perley and Rideau Veterans’ Health Centre since its inception. This characteristic is evident in the recent update of the 2010–2025 Strategic Plan. The update better aligns Perley Rideau with the Province of Ontario’s Aging at Home strategy, and improves our ability to help seniors and Veterans live life to the fullest. Work to update the Strategic Plan during 2016–2017 included extensive consultations with staff, residents and volunteers, as well as with provincial and local healthcare authorities, and represents the latest stage in our continuous evolution. Established in 1995 as an amalgamation of three existing healthcare facilities, the Perley Rideau continues to lead and innovate in the care of Veterans and other seniors. A telling example is the collaboration on an innovative new unit supported by our valued partners from The Ottawa Hospital and the Champlain Local Health Integration Network. The SAFE Unit (Sub-Acute care unit for Frail Elderly) establishes a new level of care for elderly patients who no longer require acute care in hospital. Under the program, these seniors transfer to Perley Rideau, where they access diagnostics, therapies and enhanced services until well enough to return to their residence. The SAFE Unit not only improves quality of care and accelerates recovery, but also frees up hospital beds, saving millions of dollars annually. This model will help the healthcare system cope with demographic trends that will continue to increase demand for health care services. SAFE is but one example of how Perley Rideau is increasing its value to the community through innovation to become known as an indispensable care provider for the region. As described in the updated Strategic Plan, Perley Rideau aims to become Canada’s first Centre of Excellence in Frailty-Informed Care. 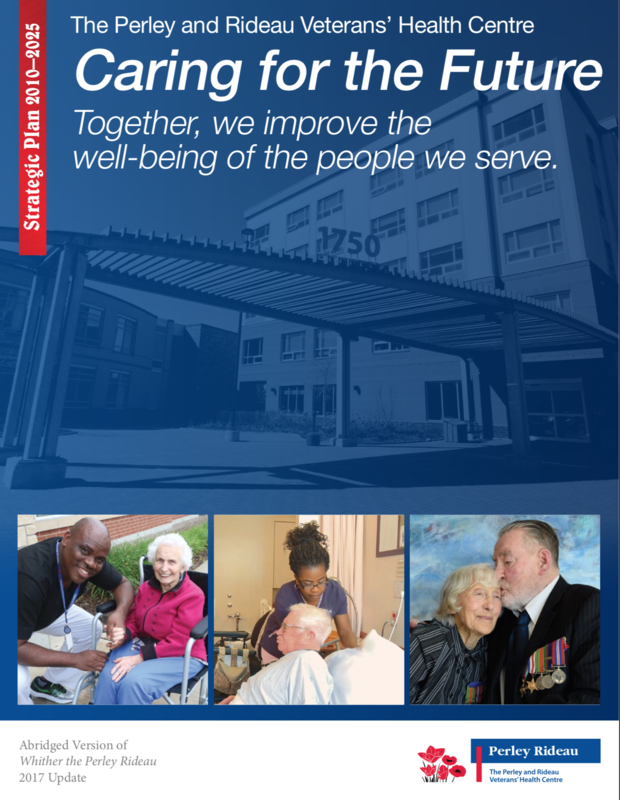 Perley Rideau will continue to support priority care for Veterans and seniors. Realizing our goal of becoming a Centre of Excellence in Frailty-Informed Care will ensure our sustainability while improving the well-being of the people we serve. The abridged version of our Strategic Plan, highlighting key milestones in our journey. Privacy - © 2019 The Perley and Rideau Veterans' Health Centre, All rights reserved.